At the Nine Clouds Mountain Qigong Sanatorium near the Six Harmonies Pagoda in Hangzhou, Zhu Hui, a medical doctor and master teacher of Qigong from Tian Tai Mountain, told this Three Treasures story one morning during a tea break. Master Zhu had been practicing Chinese medicine for nearly 50 years, and his teaching was always a rich mix of medical, Daoist and Buddhist influences. A young monk felt he was prepared to deepen his cultivation practice and his master gave the assignment to cultivate inner quiet and discover the secret of the source of life and its application to the preservation of health and vitality. He gave the suggestion to focus on the Earth Elixir Field (Di Dan Tian). After some months of practice, the young monk reported to the master that he felt sure that the most practical answer regarding the secret was nourishment, rest and the conservation of Qi and inner resources. The master encouraged the young monk, “You have found the secret to preserve the Jing and sustain the body, but you have not found the source of life.” The master teacher asked the young monk if he was still interested in pursuing the deeper secret. The monk nodded and the elder gave him the suggestion to focus on the Heart-Mind Elixir Field (Xin Dan Tian). Some years passed. When the younger monk returned he was older. The elder monk said, “Tell me in one word”. The younger monk said, “Unity”. They both smiled quietly, knowing their was nothing more to say. They parted, both knowing that even though they would not meet again, they were always together at the Source. When people turn to Qi cultivation, like the young monk, the focus is usually on health and the preservation of the body. When people discover the magnitude of the power of the Qi (after all it is the energy that runs the entire universe), body health and longevity frequently become secondary benefits of attaining peace of mind and heart. In the tradition of Qigong, it is believed that once you taste or experience one of the treasures that you are destined to pursue the cultivation of that treasure. As you begin to deeply understand and experience your Body Essence (Jing), your Heart-Mind (Xin) or your Spirit (Shen), you will likely be inspired to cultivate them because the promise is so great. When we cultivate Body Essence it leads to vitality and physical healing. When we purposefully access the Heart-Mind and cultivate the treasure of Heart-Mind Elixir it nourishes peace of mind and emotional healing. It is a rare person who does not become attracted to having peace of mind once they have begun to experience it. What if you were already whole? The Spirit does not require healing; Shen is inherently and supremely well. Shen resides with in the Heart-Mind longing to be revealed, expressed, and radiated. When the Heart-Mind is cleared of its typical restraints including fear, judgement and all sorts of trauma, Shen expresses as radiance. The cultivation of the treasure of Spirit can trigger the release of miracles. The Heart-Mind is the secret gate through which thoughts, feelings, emotions and attitudes are cleansed and purified. The sincere deepening of Qi cultivation practice requires that intention and will become major focus areas in practice and in life. In ancient traditions, retiring to a cave in the mountains or going to the desert, to disassociate from the material world were primary ways to pass through this secret gate. That is why it is often called the “Mysterious Pass”. It was also called the “dark feminine” in many translations because the Heart-Mind gate operates more on surrender communication and collaboration than on conquest or control. The legendary Bodhidarmha, who many revere for having brought Buddhism to China and who was legendary founder of the Shaolin Temple, faced the wall of a cave in deep meditation for nine years. The intensity of his Heart-Mind purification burned his image into the cave wall. In modern times, however, most people find it difficult to clear the Heart-Mind, even with years of meditation practice. The intensity of the busy and confused world constantly challenges and activates the nervous system, the heart and the mind. If distraction, busy-ness, constant list making or worry and judgment (of self and others) challenge your Qi cultivation, consider integrating holistic mind/body medicine and group support or counseling along with Qigong and Tai Chi, as complementary tools for helping to clear the Heart-Mind. In other words the fire of intent that is required to change Heart-Mind integrity (behavior) is so dynamic that it radiates a profound heat. This suggests that changing the habits of the personality (Heart-Mind) will require rigor and discipline – Heart-Mind fire. Intentful mind leads the Qi. You can combine Qigong practice with meditation, purposeful declaration, and visualization into powerful imagery and focus that can be used in either stillness or movement. In the relaxed state, mind (intent) with directed visualization or inner affirmation combined with the body movement and purposeful breath practice purify the Heart-Mind Qi. When you make the choice to “let go” of a grudge or forgive someone who has been unfair, you are removing a factor that may have been depleting or stagnating your Qi — inner resources. The grudge or withheld forgiveness is not hurting the begrudged or the unforgiven one. Instead, the damage is done to the one who holds the grudge or withholds forgiveness. Holding these kinds of feelings constrains the Heart-Mind, exhausts the Qi and overshadows the incredible but buried splendor of the radiant Shen spirit. Declarations and blessings in chants or prayers may be integrated into Qigong practice to sustain the benefits throughout the day – starting upon waking and including the moments before and even continuing into sleep. Zhu Hui, was from the Tain Tai mountain – a melting pot of Daoist and Buddhist influences. He often said it is the mind (Heart-Mind) focus that makes what appears to be a simple exercise into a powerful Qigong practice. He often used the following chant in conjunction with his teaching of one of his favorite Buddhist forms, Lotus Flower Qigong. Disturbed Qi is pulled down into the earth. In this my heart is purified. Disturbed and distressed emotional energy is pulled down into the earth. In this my heart and mind are purified. Will achieve Oneness and Unity. This declaration, and any declarations like it, stated with sincerity and intent helps the practitioner to sustain the focus on purifying the Qi in the practice. Everything from physical sickness to mental/emotional disharmony is being dispelled – Qi channels and pathways are cleared with the power of intent. “Who seeks Dao, achieves Dao” is a promise of Qigong, Tai Chi and all forms of Qi cultivation. It acknowledges that cultivation in a purposeful state will connect the practitioner with his or her true state of radiant wellbeing and eternal spiritual life. Learn to make medicine with your own body: Join Dr. Roger Jahnke for Entering the Qigong and Tai Chi Way at the Art of Living Retreat Center from April 28th-May 3rd, 2019. Ready to share the healing power of Qigong with others? Dr. Jahnke also teaches the Healer Within Qigong Certification at the Art of Living Retreat Center from April 26th-28th, 2019. Dr. Roger Jahnke, OMD, has dedicated his life to sharing the powerful holistic healing traditions of China. 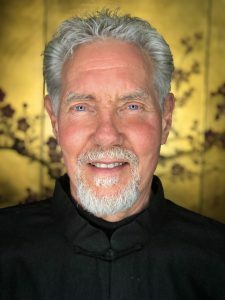 Author of The Healer Within and Director of the Institute of Integral Qigong and Tai Chi (IIQTC), Dr. Jahnke has been a practitioner of these techniques for over four decades and is renowned for the clarity, compassion, humor and depth of his teaching style. Along with colleagues at the IIQTC Dr. Jahnke has contributed to the research evidence base supporting the practice of Qigong and Tai Chi and has trained over two thousand teachers around the world. This post includes excerpts from The Healing Promise of Qi by Roger Jahnke, and is reposted with permission from the author.